The United States has Wednesday designated radical Islamist sects, Ahl as-Sunnah lid-daʻwa wal-Jihād, also known as Boko Haram and Ansaru as foreign terrorist organisations, FTOs. “These designations are an important and appropriate step, but only one tool in what must be a comprehensive approach by the Nigerian government to counter these groups … to help root out violent extremism,” the State Department said in a statement. 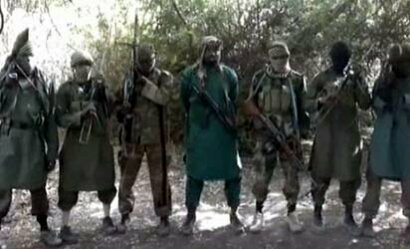 A picture taken from a video distributed to journalists in recent days through intermediaries and obtained by AFP on March 5, 2013 reportedly shows Abubakar Shekau (C), the suspected leader of Nigerian Islamist extremist group Boko Haram, flanked by six armed and hooded fighters in an undisclosed place. The State Department’s statement, quoted by agencies reports, reads: ”In the last several years, Boko Haram and Ansaru have been responsible for thousands of deaths in northeast and central Nigeria, including dozens of attacks on churches and mosques, targeted killings of civilians, and the 2011 suicide bombing of the United Nations building in Abuja that killed 21 people and injured dozens more,” White House homeland security advisor Lisa Monaco said in a statement. “All of our assistance to Nigeria stresses the importance of protecting civilians and ensuring that human rights are respected. That assistance and these designations demonstrate US support for the Nigerian people’s fight against Boko Haram and Ansaru,” the State Department said. Our Reporters checked on the US Department of State’s website revealed that Boko Haram and Ansaru were listed as number 52 and 53, respectively, on the Foreign Terrorist Organisations list. Other FTOs on the list are; HAMAS, Revolutionary Armed Forces of Colombia (FARC), al-Qa’ida (AQ), al-Qaida in the Islamic Maghreb (AQIM), Indian Mujahedeen (IM), al-Shabaab, Communist Party of the Philippines/New People’s Army (CPP/NPA), Real Irish Republican Army (RIRA) among others. Blogging is cheaper than therapy.